After being laid off from his job at a chemical plant, Jeral Gray formed the choir in 1994, with the mission of bringing more youth into the church and giving young singers (16-25 years old) an opportunity to use their talents for the Glory of the Lord, thus giving them "an alternative to the distractions of the streets, which can be alluring." Jeral Gray explains, "I had been doing music part-time for most of my life, and I just felt a prompting telling me it was time to make that the focus of my life. I didn't know what to expect, but I followed that word, and I never looked back since." Looking around his hometown of Chicago, he saw a lot of talented young Christian musicians, all looking for ways to serve the Lord with their considerable vocal gifts. After feeling a strong personal call from the Lord to be in ministry to the younger generation, starting with youth of his community, Jeral got to work, enlisting the help of his older brother, Percy, who soon became "an intregal part of the aggregation." Jeral Gray explains, "Everything we do, my brother and I do together. It wasn't long before he became a part of things. He has definitely been co-owner of this choir and its vision...and my key inspiration from the beginning." Percy Gray, Jeral's older brother became the founding onstage director for this choral group. As of 2004, the New Direction Choir has grown to 43 + voices (median age: early 20's) accompanied by a five member contemporary Gospel band. 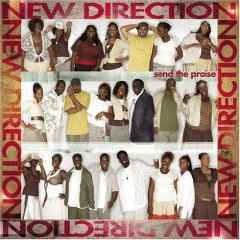 Under the label of Myrrh Records, their first album was released in May 4, 1999, entitled NEW DIRECTION. Their second album was released in 2000, entitled GET YOUR PRAISE ON. Both albums received multiple Stellar and Grammy Award nominations. Under the label of Gospocentric Records, RAIN is their 3rd album, released February 24, 2004, which promises to bring them front and center in the Gospel community and broaden their audience appeal to include a much wider following, across generations and denominations, due to the nature and fresh mix of Gospel styles found throughout this new CD. 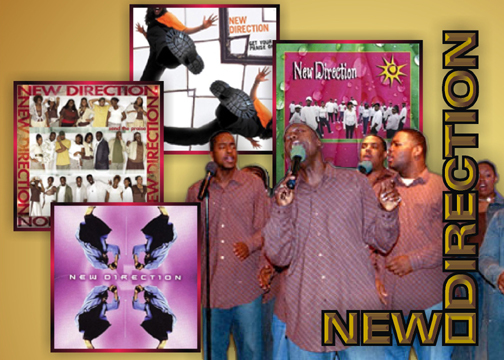 After RAIN was released, New Direction went on tour with other Gospocentric artists, a tour called "Experience The New Life Tour," which happened during Feb. - March 2004. Byron Cage, Natalie Wilson & SOP, Ramiyah, and RiZen also toured with New Direction. Four songs from the RAIN album have been released as Radio singles and have gained a strong following among radio audiences. Radio audiences have grown to love I'M IN LOVE WITH JESUS, I'M GONNA WAVE MY HANDS, A SONG and HEAL THE LAND. Today, Jeral and Percy Gray describe their involvement with New Direction as ones of "overseers, keeping New Direction on track, each with a specific expertise, as well as equally sharing credits as the group's arrangers, producers, and cowriters of most of the musical / vocal compositions. Although Jeral Gray no longer performs with New Direction, he is still its "behind-the scenes man in matters of business and creativity." Percy Gray is no longer the on-stage director of New Direction, but instead now finds his talents being put to good use as both a vocalist for New Direction and the "exhorter" of their audiences and congregations during New Direction's performances, following the example set by one of his earlier mentors, Rev. Milton Brunson. Choir Director: Demond Johnson - Percy Gray has passed the baton onto a new choir director, Demond Johnson, who was hand-picked, trained, and discipled by Percy Gray himself. Vicki Lataillade and Monica Bacon and Percy Bady - Vicki Lataillade and Monica Bacon were the Executive Producers of this CD, thanks to Percy Bady who brought the New Direction to their attention at Gospocentric Records. Percy Bady first introduced New Direction to his own fans on his new CD, The Percy Bady Experience by having them sing the back-up vocals for the song, KEEP ON DREAMING. Percy then introduced them to Vicki Lataillade of Gospocentric Records, who became the CD project coordinator along with Monica Bacon. Percy Bady also contributed two songs, A SONG and I CAN MAKE IT, which he produced and arranged for the New Direction Choir. In Chicago, Jeral and Percy Gray Jr. grew up in "a solid churchgoing God fearing home", and were enveloped in traditional Gospel music at both home and church. Being musically curious, Percy and Jeral would enjoy jazz and popular R & B albums as well, which were covertly slipped into the house. R & B Artists such as the GAP Band, Earth, Wind & Fire, and James Brown, and a number of modern Gospel's pioneering acts such as Andrae Crouch, Commissioned, and the Winans all became major influences. This enriched the musical development of Jeral and Percy, who displayed their musical talent at an early age. Jeral became proficient in playing the drums, organ and keyboards, and Percy became a talented singer, arranger and song writer. However, though they had the ability to perform in any style of music, they always focused their talent and energy in creating Gospel music, their first love, in their own unique way. So, it's not surprising that the musical programs performed by New Direction can be described as "Old School using New School Singing." 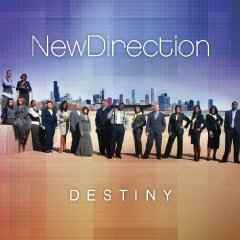 Under the leadership and guidance of Jeral and his brother Percy, New Direction specializes in "taking Gospel traditions in truly new directions, crossing lines not only of musical tastes, but even more importantly, race, religion and creed." Jeral Gray explains, "You wouldn't hear New Direction and think 'Traditional Gospel' at all, but there are roots that go deeper than just what you hear in the grooves. I'm the oldest one in this bunch, so while I've caught the contemporary side of things, I also go back with the old-school Gospel, and it touches everything I do in some way or another. That was music that was straight from the heart and soul, and the Gospel message was always front and center in the lyrics. There was no mistaking what they were talking about. And I would like to think the same is true in everything New Direction does as well. Plus, Gospel music is the foundation of so much of all contemporary music. If it hadn't been for that, we wouldn't have had anything to build from."